Clutter. It affects every age, and its’ lasting effects can be debilitating, especiallyto Seniors aging in place. If you notice any of these characteristics about your Senior loved ones, or their homes, clutter could start creeping up on them. Kitchen: Cabinets filled with pots, pans and dishes, often unused and more often, unreachable. A senior can fall trying to reach them. A freezer and fridge filled with expired and old food can cause food poisoning or malnutrition for the Senior. Bills on the counter and kitchen table can result in unpaid bills. Bathroom: Expired medications, old makeup and toiletries, resulting in missed medication and accidental overdosing, and possible skin infections and irritations from expired products. Cluttered shelves create the probability of the inability to locate necessities. We’ve seen bathtubs holding papers and clothing, compromising hygiene. Bedroom: Piles of papers and magazines on and under beds are a fire hazard. Piles of shoes, clothing and toiletries create confusion, anxiety and insomnia. Stairways: Magazines, newspapers, shoes and debris on the steps are a tripping hazard. Basements: that have become a catch-all for everything become a home for rodents, mold and mildew. 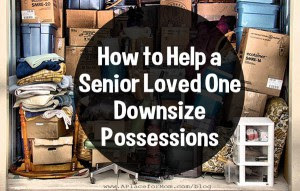 Understanding why Seniors hold on to ‘stuff’ is important to determine so that you are able to successfully support them in decluttering and making their home safe. The Sense Of Loyalty: Older adults who’ve received gifts from family and friends may may be reluctant to part with them. Encourage your loved one to give unused gifts back to the giver or grandchildren, or donate them. The Need To Conserve: Seniors are the original green people. Appeal to a senior’s desire to help others. “You went through the Great Depression, now it’s time for you to let go and help someone else.” Counter a senior’s inclination to conserve by appealing to their desire to give back. The Sentimental Attachment: The beloved dress represents the history and memories of the event; it’s not the dress itself. Save only a small piece of the dress to quilt or display in a shadow box. Scrapbooking and converting photos to DVDs are other ways to save treasured keepsakes. The Fatigue: A home with a lifetime of memories can easily become too much for an older adult to handle. 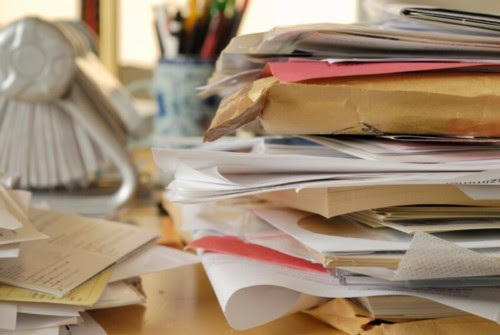 Help seniors manage clutter by establishing online bill paying. Also, get your senior off junk mail lists, which can put them at risk for identity theft, and buy them a shredder. The Change In Health: Seniors who have suffered a brain trauma or stroke, who are wheelchair bound or who are experiencing dementia may no longer be able to manage household duties, which could contribute to clutter. If you see a health change, encourage your senior to visit his or her doctor and consider a professional organizer and caregiver to help your loved one. The Fear: Seniors often fear what will happen if they give up their stuff, like the older adult who saved six decades of income tax statements. Use logic and information to help seniors understand that it’s okay to let go. The Dream of the Future: Those clothes in the closet don’t fit anymore, but your loved one is sure that someday she’ll lose enough weight to get into them. Ask seniors to fill a box with clothing they don’t wear much and make a list of the items in the box. Agree that if they have not gone back to the box in six monthsto wear the item, they will donate that to charity. The Love of Shopping: Today’s seniors have more money than any other previous generation of older adults and they love to shop. Clutter can become so bad seniors can’t find things and they repurchase items they already have, contributing to the clutter cycle. Try to convince seniors to cut back and to say “no” to free stuff. The Loneliness: Stuff can become a misplaced companion. Loneliness may also lead to depression, which makes it difficult for seniors to get organized. Previous Post8 Flooring Alternatives that Will Make You Rethink HardwoodNext PostFixing up your Rental Property?